Very recently, a ruling was made by a federal judge against McCormick & Co, and has since opted to proceed with the lawsuit regarding the size of its ground pepper product. This was despite a rquest by the company to dismiss the motion. 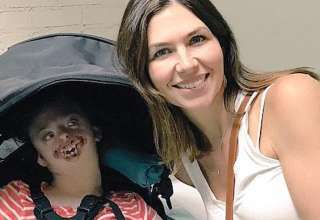 McCormick’s were sued last year by smaller spice company Watkins, Inc., when they discovered their competitor had removed 25% of their product and continued using the same tins. The picture below shows exactly why Watkins are proceeding with their case. When both tins are placed side by side, McCormicks appears to have more pepper in their container than the Watkins tin has – but this is simply down to a visual marketing trick. 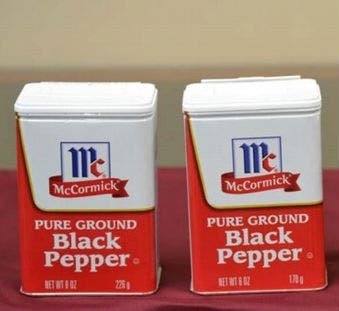 To simply put it, McCormicks are utilizing and optical illusion to sell more ground pepper than their competitors. Do you think this is fair on the consumer and the rival competitors? Even though both tins appear to be similar in size – which they are, this is not the case. The tin on the left contains 8 ounces of ground pepper while the one on the right contains only 6 ounces. The final tin which is black in color is Watkins product and contains 6 ounces of product. Both companies are selling the same amount of ground pepper in their tins, however, McCormick uses a larger tin in order to fool the customer into thinking they are getting more pepper in a bigger tin. This is the very reason Watkins have sued McCormick. 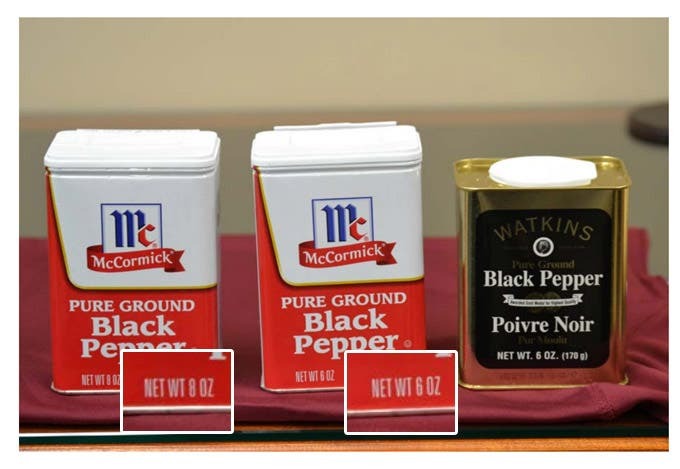 They claim that McCormick are deceiving the customers by selling less ground pepper in a concealed tin and not reducing its size. Although the product says 6 ounces on the bottom instead of 8 ounces, it is written in tiny font that only the most astute shopper would notice. Watkins claim that this deceitful marketing by McCormick has affected their sales of spices. Visually when put side by side the McCormick tin is more attractive and the customer assumes they are getting more for their buck, but truth be told – both containers hold the same amount of spice. McCormick’s defence to these claims is that they have done no wrong and have not falsely advertised their product. Why? In McCormick’s eyes the product clearly has the weight stated on the tin. Now McCormick are facing being sued by not only Watkins, but by the consumer also. They now face the possibility of class action law suits from customers who feel they have been conned out of their ground pepper. Are you a consumer who has purchased this product without noticing the change in the amount of black pepper you are getting? Currently the case is making its way through the federal courts. As a consumer, you should always be wary of a product you buy. Always inspect them to ensure you are getting what you think you are getting because companies are always looking for clever methods to sell less product for more. They will try to rip the consumer off in any way they possibly can! Be sure to SHARE this article with family and friends and lets put a stop to this deceitful products being on the shelves.